Here's something you may not recognise these days. Yeah, it's a magazine cover shot of leading female singers of the day - for something called New Musical News in 1979 - and all of them are fully dressed (see also). 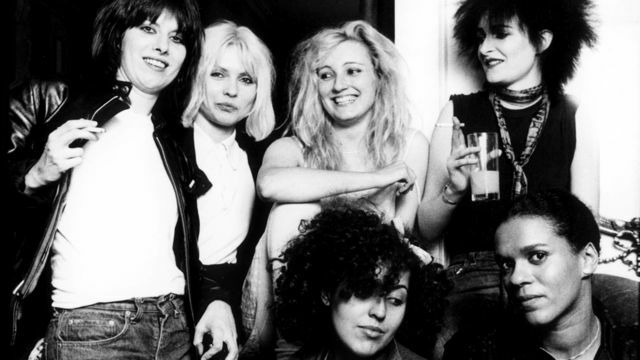 From left: Chrissie Hynde, Debbie Harry, Viv Albertine, Poly Styrene, Siouxsie Sioux, Pauline Black. The latter hosted a Radio 4 documentary on the strong female artistic and often challenging inclination in punk and new wave/post-punk, interviewing Styrene, Albertine, Sioux and Gaye Advert, as well as Jean Jacques Burnel for balance. It's up until Sunday 21st. Liked Charlotte H's comments that you linked to, although bemused that everyone responding used PJ Harvey as an example of a female musician who doesn't have to take her top off to get press coverage. Which is true, if you ignore her first NME cover.